During our German Course for the Viennese University Preparation Program, our top qualified trainers will efficiently prepare you for the supplementary German test you have to take before you can begin studying. Our course rooms are spacious, come with modern equipment, and are easily reached using public transport. You will be allocated a course level that corresponds to your language skills based on the results of the placement test you have to take. The courses include 320 45-minute teaching units each semester, and take place five times per week. There are 20 students in each course. You don’t have to take part in all course levels. 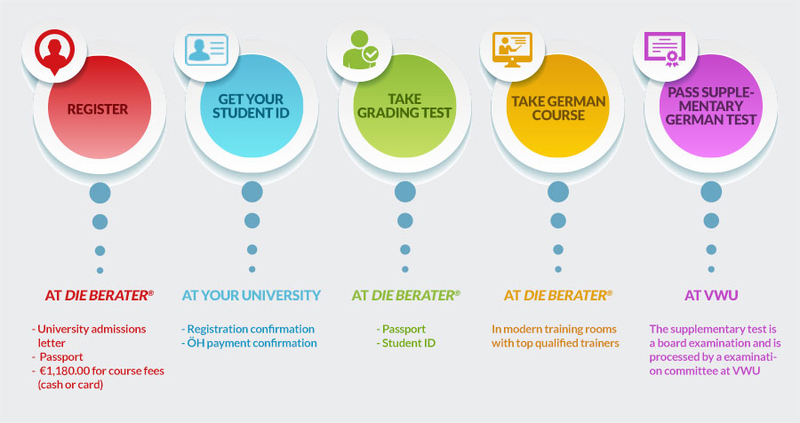 It is possible that you take the supplementary German test (EPD) after the FG or WF course. 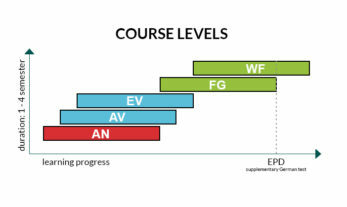 Depending on learning speeds, even beginners without prior skills can take the EPD after just 2 semesters. Students are allowed to attend courses for up to four semesters before taking the EPD. In some cases, a fifth or sixth semester may be approved by the commission. Course fees: €1,180.00 including VAT. Payment should be made in cash or by card when registering. Costs for materials can also be paid in cash or by card when registering. Various course books. Payment in cash. Course allocation depends on students’ results at the placement test . Unfortunately, requests for specific course times can only be taken into consideration if there are corresponding courses.